The Fugue made amends for a couple of unlucky runs with a smooth success under Richard Hughes in the Markel Insurance Nassau Stakes. Tom Queally almost stole the race from the front aboard Timepiece but Hughes made giant strides down the outside to get up and score by one length aboard the 11/4 winner. Gosden’s stable jockey William Buick elected to ride 7/4 favourite Izzy Top but the pair were trapped out wide and weakened to the rear of the field. The Fugue had marked herself out as an improver when winning the Musidora at York in May but suffered an interrupted passage when third in the Investec Oaks and found the soft ground against her when second in the Ribblesdale at Royal Ascot. Gosden said: “If ever a filly had deserved a Group One then it was her. She is a very good filly and has been unlucky. 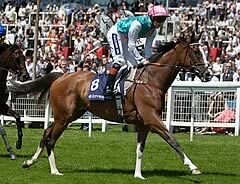 She won the Musidora - there is no point talking about the Oaks and the ground was too soft for her at Royal Ascot. It was a 20-day gap between the Oaks and the Ribblesdale, but she was feeling the effects of about half an inch of overnight rain. She went there in very good form but she has tiny ballerina feet and ballet dancers don’t go particularly well in a swamp. She is as smooth as silk and Richard enjoyed riding her. “There was no pace today but that can happen in small fields. Tom Queally (on Timepiece) dictated and he relaxed the pace. Izzi Top got caught out wide when Ryan Moore came forward on Was and after that Izzi ran with the choke out and was too fresh. “Hughsie sat calm though and has given the winner a lovely ride. “I walked the last mile of the track with my stick before hand in case I was not happy with the ground but it was just the easy side of good. “William had the choice but had to pick Izzi as she was the Group One winner, but The Fugue has shown her class today and we will look at the Yorkshire Oaks with her. A scintillating late run, orchestrated with familiar aplomb by jockey Richard Hughes, enabled The Fugue to land the Group One Markel Insurance Nassau Stakes at Glorious Goodwood today. Hughes’ colleague, trainer John Gosden’s stable jockey William Buick, normally rides the winning filly - whose starting price was 11/4 - but he opted to ride her stablemate Izzi Top, the 7/4 favourite who finished sixth. Gosden informed Hughes’ agent that he was on the shortlist for the ride earlier this week, and after a few days in which the jockey found himself “fence sitting”, he duly produced the goods on the day for owner Lord Lloyd-Webber. Of the far happier occasion today, he said: “What a fabulous spare! One aim that William and I agreed upon before the race was not to knock each other down. William jumped quicker than me so I sat in behind him and was always going well. I regarded Izzi Top as my greatest danger and I was never more than two lengths behind her so I was in no danger of getting too far back. “The more I was pulling my filly back down the straight the more she loved it and the more likely I was to win. John Gosden had said to me ‘just bear in mind she had a very hard race in The Oaks and again at Royal Ascot and wouldn’t want another’. “She’s definitely better on a level piece of ground, and I know good movers usually act around Epsom. “I’ve spoken to William and he’s fine - he accepts that jockeys have to make difficult decisions now and again. It was fortunate for me. And William has won a couple of Group Ones this season. “The Fugue is a beautiful filly - I have never had anything to do with her before and this is the first time that I have seen her. From the time I got on her, there was a lovely rhythm about her. She floats and was like an elastic band, ready to quicken. 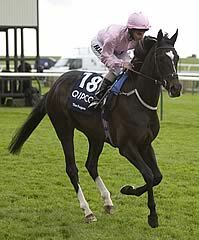 The sequence was started by Fallen For You in the Coronation Stakes at Royal Ascot and followed by Izzi Top in the Pretty Polly Stakes at the Curragh, Great Heavens in the Irish Oaks, also at the Curragh, Elusive Kate in the Prix Rothschild at Deauville and The Fugue in today’s Markel Insurance Nassau Stakes at Glorious Goodwood. There have so far been 12 Group One races in Europe confined to fillies and mares, and all have produced a different winner. The Markel Insurance Nassau Stakes is part of the QIPCO British Champions Series and the other races in the filly and mare division are the 1,000 Guineas, the Oaks, the Falmouth Stakes, the Yorkshire Oaks later this month and the series finale on Champions Day at Ascot in October. The Nassau Stakes, established in 1840, had been won the previous three years by now-retired Midday, who last year gave her trainer Sir Henry Cecil a record eighth victory in the race. Midday was preceded by Roussalka (1975-76), Connaught Bridge (1979), Nom De Plume (1987) and Lyphard’s Delta (1993). Cecil had the second today Timepiece, like Midday owned and bred by Khalid Abdulla. Gosden, who also saddled the 7/4 favourite Izzi Top (sixth), was enjoying his second winner in the Markel Insurance Nassau Stakes following Ryafan in 1997.